Une prise USB de la JBL PartyBox vous permet de charger d'autres appareils USB directement sur l'enceinte. Ainsi vous n'avez pas besoin d'avoir un chargeur supplémentaire pour maintenir vos appareils chargés. 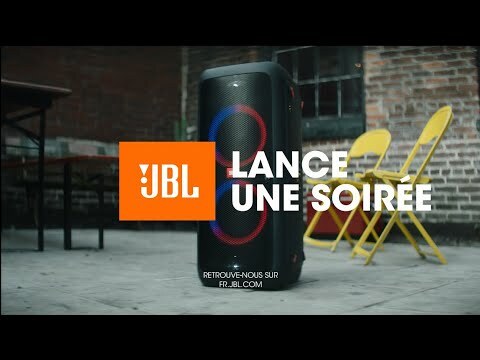 La JBL PartyBox 200 est une puissante enceinte de soirée dotée d’une qualité de son JBL et d’effets lumineux. Grâce à son entrée 12 V CC, vous pouvez faire la fête n'importe où. Branchez votre micro ou votre guitare, et offrez à vos amis un moment de musique inoubliable : diffusez votre musique via Bluetooth ou à partir d'une clé USB. Connectez deux enceintes PartyBox sans fil grâce à la fonction TWS ou en branchant un câble RCA IN/OUT entre les deux enceintes. C’est l'heure de faire la fête ! JBL PartyBox 200 est évalué 4.7 de 5 de 19. Rated 5 de 5 de FBGZAY par What an amazing JBL product! JBL products never disappoint me , everything from the features to the sound quality is amazing! Thanks JBL for another wonderful product. Rated 5 de 5 de Ratman79 par This PartBox is a Beast! My JBL PartyBox 200 came in yesterday, I could not wait to get into it and get the tunes coming out of it...and man they did! We were rocking the farm last night. This is literally a Party in a Box, the lyrics were crystal clear, the bass was perfect and the bluetooth would reach all the way across my huge yard, and still sounded amazing. JBL never disappoints, their high quality products produce a very high sound sound! My son has already asked for one for his room and there is no doubt this is the one to buy! Rated 5 de 5 de benrudolph par Never imagined how much fun this speaker would be! First off, I never imagined wanting a speaker like this. But after using this thing for a week, I can now say I want another! It has been a fun speaker to use. I know the neighbors and wife are growing tired of me cranking this thing and the house shaking. But I can't help it! As far as sound quality, I was pretty impressed. Of course it has the signature JBL sound, which leans a bit more on the bass. But I was pleasantly surprised with the Bass Boost off. I could hear a good range of sound that wasn't drowned out by the bass. But when I did want bass, this thing does not disappoint. What was very impressive for me was even at max volume, there was little to no distortion. I was very impressed. The only negatives so far for me was thinking this model had the rechargeable battery. It looks very close to the 300 and if you don't pay attention I can see people buying and thinking this has the battery. I also thought the handle design was a little off when it is laying down horizontally. The handles are at the back and you have to roll it over to grab them. So another set of handles might help out. My reasoning for the four stars on sound quality and technology are that the sound isn't high fidelity. But this is a partybox, meant to be loud and thumping. If you know that going in you'll be fine. And I think a battery in this model would have taken it to a five star for me. Rated 5 de 5 de TJ Stegall par Amazing Product I received this product a result of being in the JBL Backstage Pass program. Wow...I can't say enough positive things about this speaker. If you're looking for a great speaker that will be able to handle anything you throw at it, this is the speaker for you. See below for additional details: Pros: 1. Overall the sound quality is amazing for this size of speaker. This speaker can power through just about everything. 2. Build quality is top notch. Rubberized carrying handles, Rubberized stops on all sides so you lay in any direction you want, mesh metal grill is top notch quality, attention to detail is great throughout the entire product. 3. The ability to carry it out to parties, beaches etc etc with the supplied cable is a huge plus. It's long enough to fit comfortably outside your vehicle with no issues. 4. You can daisy chain them together via TWS which is a great feature to have as well as having the ability to use it as a left and right speaker for any music setup. 5. The BASS BOOST feature is another great thing to have especially for those songs where you want that added extra thump. I personally leave it on the whole time. 6. The buttons are very clicky and have a great rubberized feel to them. 7. The ability to toggle the light show is pretty neat...especially cool in a low lit or dark room. 8. The ability to use it with a thumb drive is very nice to have especially if you have a playlist built onto it plays seamlessly with no issues. 9. Did I mention ability to charge external devices. This came in very handy. Cons: 1. Wish there was the ability to sync the light show with the bass to some degree. This would really let you personalize this device. 2. It can be quite heavy to move around. 3. Also, it would be nice to be able to operate the unit after it enters standby mode via your phone or device. You physically have to turn it back on once it powers off after no use. Overall, I'm very satisfied. I could go on and on about the JBL Partybox 200. This is a monster speaker to have. You will not be disappointed with this and I'm a pretty picky person. If you like the JBL Charge series or the JBL Boom box, you're definitely going to love this. I highly recommend this product on all fronts. It's just great in every area from music playback to, guitar and mic setups to carrying to the beach and using a 12v charger to power up your karaoke session..the JBL PARTYBOX 200 won't disappoint. Rated 5 de 5 de RubenGG par This thing is the rave! (literally) I just received my PartyBox 200 and took it for a test drive, and here are my first impressions: - It is BIG and quite heavy. Make sure you pay attention to the dimensions to avoid surprises. - It is POWERFUL. I turned up the volume to test it and I didn't quite go all the way because I feared my neighbors would call the police. - It SOUNDS GREAT. I'm a big fan of the JBL sound (I also have the JBL L16 in my living room and after a few years of owning it I still love it). The sound is clear at high volume, and the bass is powerful (esp. with the "Bass Boost" mode on) - It is BEAUTIFUL. It looks modern and sleek. The light modes are fun and contribute to the party atmosphere especially when it's dark. There's three light modes and you switch between them by pressing the button on top of the speaker (plus a no light mode). - It is very easy to set up and use. Just plug it in, turn it on, press the Bluetooth button on top and pair your phone to it. Which is great for parties so different people can "DJ". - I don't anticipate giving much use to the mic and guitar inputs, but that's a nice feature for more serious musicians/singers/karaoke aficionados. All in all, I'm very excited about my new toy. I intend to use it outside for rooftop parties and this thing will easily fill the space (I won't be able to turn it up all the way) and make for fun parties with the light effects. Some areas for improvement: - In addition to Bluetooth, it would be nice if it had support for Airplay (like the L16 speaker does) - To be fully portable, it would be great if it had a battery instead of needing to be plugged in all the time -> The PartyBox 300 has this, and if this is important to you I think the extra $70 are more than worth it for true portability. - It would be nice if it was splashproof. I will be using it outdoors and I'd rather not have to be running for my life to cover it any time it starts to drizzle :). - Not sure how feasible this is, but it would be nice if it was a bit lighter (it is not exactly featherweight when you're moving it around). Feel free to shoot me a note if you have any questions! how many dB is the output? Hi, and thank you for your interest! We do not specify max. SPL, and it would be pretty uninteresting anyway, since that depends to a very large degree on the frequency content of the signal. Deep bass will eat up a lot of energy without sounding particularly loud, and a lot of midrange can sound intolerably loud, with much less energy used. I can say that Partybox can play very, very loud. Whether it plays loud enough for you is a totally individual assessment. If you want to cover an auditorium with 500 people in it, it can probably not play loud enough, or move enough air in the bass, but in a normal living-room, I think all would consider it plenty loud. And of course, you can always connect a second Partybox to increase bass volume and max volume a lot. Try it out, I think you will be impressed. Merci pour votre question. Vous devriez pouvoir connecter un piano &eacute;lectrique &agrave; la JBL PartyBox 200, sur la m&ecirc;me entr&eacute;e que pour la guitare &eacute;lectrique. En fonction de l'imp&eacute;dance de sortie du piano, il peut y avoir un probl&egrave;me de volume / qualit&eacute; du son, car la PartyBox n'est pas con&ccedil;ue pour &ecirc;tre utilis&eacute;e avec les pianos &eacute;lectriques. Veuillez &eacute;galement noter que pour tous les produits achet&eacute;s directement sur notre site, vous b&eacute;n&eacute;ficiez d'un d&eacute;lai de r&eacute;tractation de 30 jours. Si la PartyBox ne fonctionne pas comme vous le souhaitez, vous pourrez ainsi nous la retourner dans les 30 jours suivant la livraison pour un remboursement int&eacute;gral. Si vous souhaitez recevoir une assistance personnalis&eacute;e, nous vous invitons &agrave; contacter le Service Client&egrave;le Harman par t&eacute;l&eacute;phone, par mail ou par chat. Vous trouverez toutes les informations de contact sur https://www.harmanaudio.fr/support-contact.html#ns. Merci. Is there any possibility to connect a jbl go extreme or boombox to the partybox? The Partybox can only be connected to another Partybox. If you have any questions, please submit a case request and so we can assist you at www.jbl.com/support-contact.html . Bonsoir , peut on l'a connecter a une TV ? Merci pour votre question. Oui, avec un c&acirc;ble RCA ou bien un c&acirc;ble Jack ( Aux) Si vous souhaitez recevoir une assistance personnalis&eacute;e, nous vous invitons &agrave; contacter le Service Client&egrave;le Harman par t&eacute;l&eacute;phone, par mail ou par chat. Vous trouverez toutes les informations de contact sur https://www.harmanaudio.fr/support-contact.html#ns Merci.